LogScanner is a tool that gives you the ability to analyze your log files and find ways to improve your performance. 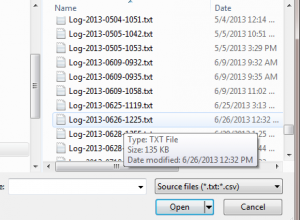 This post covers the first step in using this tool; loading a log file. 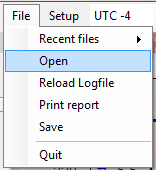 Start LogScanner (part of OckamSoft 5) and select Open from the file menu. LogScanner reads Ockam log files (plain text files formatted like this: Log-yyyy-mmdd-hhmm.txt) and Expedition log files (text files formatted for importing into Excel formatted like this: ddmmmyyyy_n.csv). The opened file is converted into a LogScanner file that contains all the additional information you add. After you initially import one of the text files, the enhanced log file is saved as <Log name>.LogScanner. After creating one, you can open it (instead of the original file) and all your work will be there for enhancement. When a file is initially opened, LogScanner goes thru and does an initial analysis of all the tacks. This makes it easier to find them and adjust the tack window if necessary. The most important thing you need to know is how good your performance was. For this, you need an accurate model to compare against. Luckily, such a thing exists – polars. If you don’t have one, you really really need to get one. We recommend the NeoPolar. If you do have one in machine readable form (a TPO or NeoPolar file type), load it via the Polars menu item on the strip view. The chart view uses marine charting tiles. You will have to download the tiles for the area of the log file if you want a chart background. You can download them via the Race application (which automatically loads them), or you can use ChartBrowser (another application included in OS5). ChartBrowser is more efficient than Race, and ensures you have tiles for any venue of interest.